Converts plain English into Pirate. Is there a better alternative to Pirate Translator? 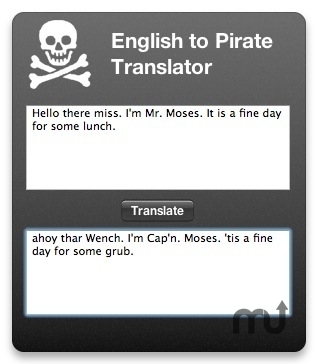 Is Pirate Translator really the best app in Card and Board category? Will Pirate Translator work good on macOS 10.13.4? For example, enter "Hello there miss, I'm Mr. Moses. It is a fine day for some lunch", and click the translate button to get "Ahoy thar Wench. I'm Cap'n. Moses. 'tis a fine day fer some grub". Added random exclamations to dress up bland untranslatable text. From the back of the widget, choose 'light', 'peppered', or 'doused' to make your text a little more colorful with random piratey exclamations. This version can also tell you if there is a new version available. It would have been great to have that feature in the last version so you would know about this version. Pirate Translator needs a review. Be the first to review this app and get the discussion started! Pirate Translator needs a rating. Be the first to rate this app and get the discussion started!